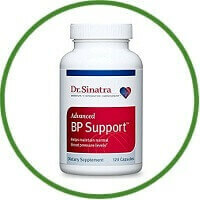 Dr. Sinatra’s blood pressure formula features MegaNatural-BP Grape Seed Extract, an antioxidant powerhouse clinically shown to support healthy systolic and diastolic blood pressure, PharmaGABA, a concentrated, bioactive form of GABA shown to help regulate stress response and coritsol levels to keep blood pressure stead, and Hawthorn Extract and Magnesium, which promotes strong, elastic blood vessels and healthy vessel dilation. The potent nutrients in Advanced BP Support work together to promote healthy blood pressure, proper relaxation and dilation of vascular and arterial walls, and healthy circulation and blood flow. The supplement also improves blood vessel strength and elasticity while providing antioxidant protection against free-radical damage to blood vessels.